Fenella can only dream of having a cat of her own. But then an unwanted stray makes his home in her old cubby, the Forever House . . . This book has two strong themes that will resonate with most younger readers. Firstly, who hasn't wanted a pet at some time in their life, and haven't been allowed to have one and secondly who hasn't had a falling out with their very best friend? Fenella LOVES cats, but she has a very big problem, she is horribly allergic to them. She gets itchy red marks on her arms, her eyes water and her nose runs. She can't even pat the neighbours cat, let alone have one of her own. 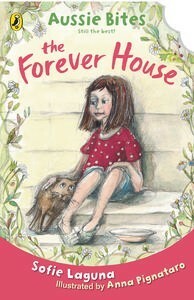 When a stray cat moves into her old cubby, The Forever House, Fenella decides that she will keep it, and it will be a secret cat, no matter how much she suffers for it! With all of this secret cat business going on, Fenella's best friend Matilda starts to notice her odd behaviour. Fenella seems much more dreamy and her mind is most definitely somewhere else. Matilda is very sporty and comes from a large and loud family, and one day when they are trying to practise their basketball skills, the girls have a big fight because basketball isn't actually fun for Fenella and she would much rather be somewhere quite with her drawing, books or her secret cat. Fenella starts to question why she is friends with someone so different from herself? That is what I really liked about this book. It may be strange for me to say, but I do like books where friends fight...because that is life. Friends don't always get on, they don't always agree on the same things, and they often haver different interests. That's all OK, people argue, and they get over it, fighting and arguing with your friends isn't the end of the world. Friendships with people who are different from you is what makes friendships interesting. It would be a boring world if everyone was the same.